Trayvond the Redguard is a mage and an Evoker of the Mages Guild who sells spells at the Cheydinhal Guild Hall. He lives a relatively laid-back life: after waking up at 6am he takes a two-hour breakfast. He will then spend most of the day reading the common text Ruins of Kemel-Ze on the second floor of the guild building, at times breaking off to cast an Alteration spell. At 8pm he eats a two-hour dinner with his fellow guild members in the east-wing of the ground floor. After spending two hours wandering around the guild building, at midnight he should head to sleep, but since he is quite late to bed, he will find all of the second floor ones taken. Instead, he will wander around aimlessly. He will always be available for services when not eating or sleeping. He wears the standard mage's robe and a pair of thick cowhide shoes. He also carries his book and a meager amount of gold. He does not wield any weapons, relying instead on a set of low-level spells from all of the magical schools but Illusion. These are also the same spells that you can buy from him cheaply, since his Mercantile is a mere 11. When you meet him for the first time he will tell you: "I'm Trayvond the Redguard, Mages Guild Evoker. Surprised? Yes, you don't see many Redguards in the Mages Guild. We don't much like spellcasters in Hammerfell. Wizards steal souls and tamper with minds. If you use magic, you're weak or wicked. My family didn't approve of my vocation, so I had to come to Cyrodiil for my education. I admit... I still have strong prejudices against necromancy, summoning, and illusion. Profaning the remains or souls of the dead is just wrong. And I'm uneasy about tampering with other's minds and trafficking with Daedra." Those beliefs give him a hard time advancing in the Guild: "My progress through the ranks here will be slow. My prejudices against certain types of magic limit my chances for advancement." Like his Skingrad colleague, Vigge, he will direct you to Borissean for the best spells: "If you're looking for the most powerful spells, you'll want to speak to Borissean at the Arcane University. If you're allowed in that is." When you are looking to obtain a recommendation he will say: "You'll have to get one from Falcar, if you can." Once Falcar has given you your task he will comment: "Falcar always has been pretty harsh, even when it comes to basic lessons. He seems to have gotten worse lately, though. I think he even scared the last Associate who came here for training. What was his name again? Hmm, I can't remember, Deetsan would know, though." When you have retrieved the ring, when asked he will inform you: "Didn't you hear? Oh, no. I suppose you wouldn't have. You'd best speak to Deetsan before you do anything else." Trayvond also has a "Daedra Cults"-topic available. 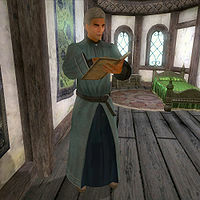 When asked about it, he will mark the location of Azura's Shrine on your map and tell you that he knows people who are currently worshipping there: "Daedra cults aren't necessarily evil, of course. In nearby Morrowind, for example, they worship Daedra in the Temple. The Azura shrine north of town, up Lake Arrius way, for instance. I know a Dark Elf there. Nothing evil about him." After having talked to him about this, Falanu Hlaalu will provide the location for Sanguine's Shrine in her dialogue. Fellow spell merchant Orintur will tell you: "Trayvond has the best shield spell outside of the Arcane University. If you can cast it, it's definitely worth adding to your selection." In reality, Orintur himself sells the best shield spells outside of the University. Technically, Trayvond offers training in Destruction, but only up to skill level 0. In other words, you will see a training icon when talking to him and you can select the training option, but you will always be told that your skill level is too high. Despite what he says in his dialogue, Trayvond has no problem offering a Summon Scamp and a Soul Trap spell for sale. This page was last modified on 15 November 2018, at 20:18.